Hosting a large event can be a challenging task , especially in terms of table layouts and arrangements. On average, a 40'x60' tent can host up to 160 people, considering the space required for tables, chairs, and other areas you may want to reserve for other purposes, like setting up a platform or a dance floor. 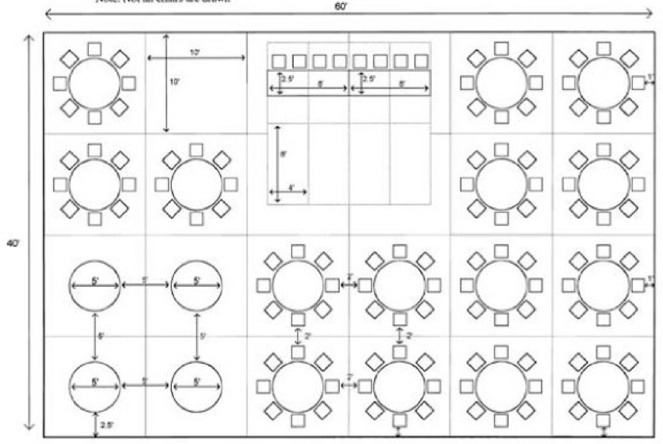 Below are diagrams to give you an idea of how much space tables and chairs take up within a 40'x60' and 30'x50' tent. Tent rates vary according to size and you can choose between solid walls or window walls for enclosure. Our rental rates (listed below) are good for a 3-day period, but you can always extend and discuss per-day rates after the standard period if your event will run longer. Our rental rates also include assembly and disassembly of the tent set-up, while delivery costs are computed based on the distance of your venue from the city. We accept major credit cards (VISA and MasterCard) along with other modes of payment, including checks, bank drafts, and cash to make payment easier. A 50% non-refundable deposit must be paid to secure a booking with us. Below are our standard rates and prices for tent, chair, table, linen, and bar and party accessories rentals. We offer discounts when you book in advance. Feel free to contact us for further details on our prices, rates, and special offers. 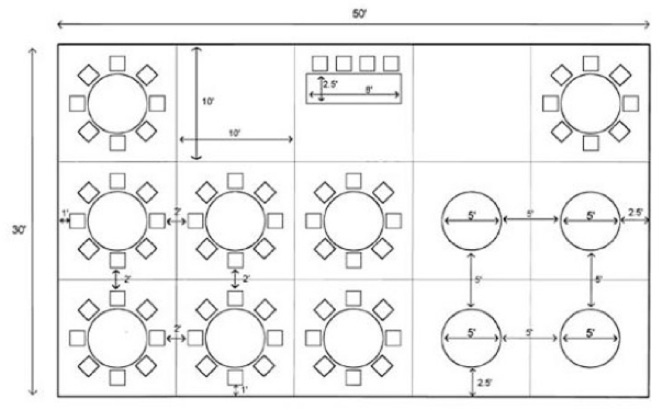 This diagram shows how much space, seating 160 people would take up in a 40'x 60' tent. This diagram is not a seating plan that we suggest; it is intended to help you think about how much space is required for tables and chairs as well as how much space you may want to set aside for other uses. Note: not all chairs are drawn. This diagram shows how much space, seating 100 people would take up in a 30'x 50' tent. This diagram is not a seating plan that we suggest; it is intended to help you think about how much space is required for tables and chairs as well as how much space you may want to set aside for other uses.